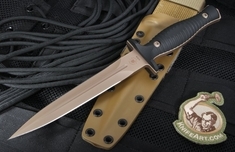 Spartan Blades George V-14 Dagger: Designed with the eye of knife maker Les George, the V-14 dagger is a blade made with special armed forces and intelligence agents mind. 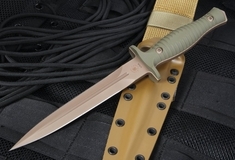 The Spartan Blades Dagger measuring at a total length of 11.5 inches, this is a combat dagger that can withstand all types of environments and obstacles on the field. The blade, measuring 6.75 inches, CPM S35VN steel (59-60 HRC) and has a full tang hollow ground profile. Each American-made blade is vacuum heat treated and double treated and tempered for superior blade edge retention. The oblong handle with flats made with contoured G10 gives great grip, even in low contour areas.